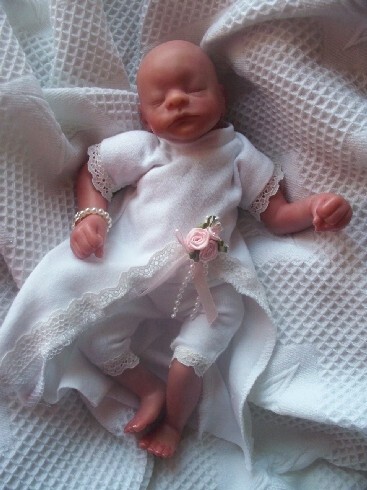 A Cut-a-way bereavement dress to portray matching bloomers with lace trimmings.decorated with a cluster of delicate pink roses and beading.Lace at sleeve edges, sheer elegance. (please note due to popularity of this particular item lace pattern may vary per order). 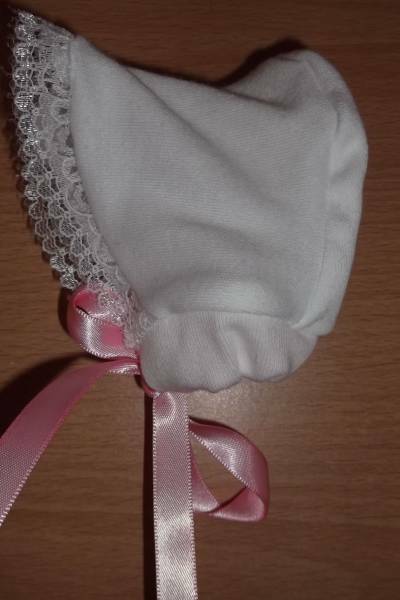 Premature baby burial gown set The sad loss of an infant is stressful enough to parents, so worrying about finding something suitable to lay baby to rest in is so important to the family.White is a symbol of purity and innocence. At such a difficult time this outfit comes in sizes to fit so you don't have to worry about dressing baby in dolls clothes just to get a good fit, Something Precious range.Something Precious Premature baby special occasion dress set.why not buy some delicious trimmed socks to match find them at the recommended section at the end of this item. PHOTOSHOOT CREATED USING REBORN BABY MODEL AND SHE MEASURES 24CM WITH KNEES BENT.